The Millibar Manual Tool Changer allows operators to effortlessly change tools for high mix, low volume production applications. Without any tools, quickly switch between adaptive grippers, vacuum grippers, camera calibration stylus, and more. Simply release the locking lever and slide a new tool into place. 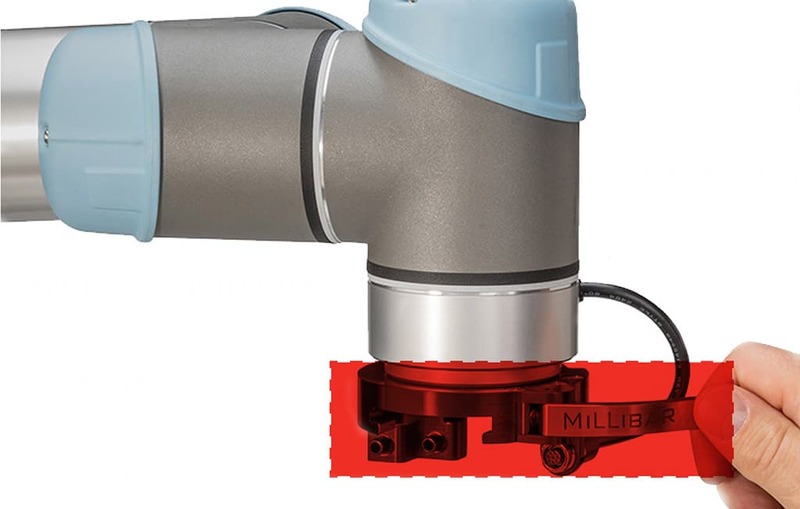 Even if your facility has a variety of robot brands, the Millibar Manual Tool Changer ecosystem allows tools to be moved between robots. "Your tool changer is a standard part of every UR in our shop. We are very pleased with your product." 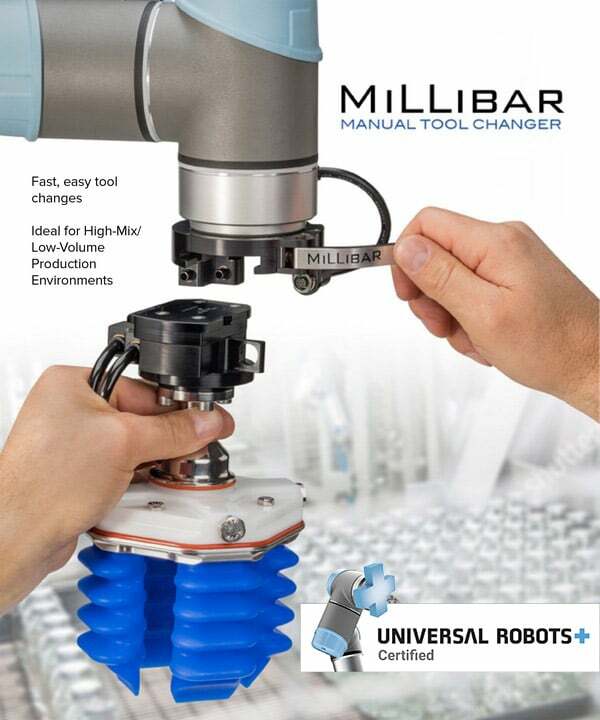 Millibar's Manual Tool Changer is a two-part solution. When ordering a tool changer for the first time, please select a complete tool changer assembly consisting of a robot and tool side. Additional tool sides sold separately. The robot side attaches to your robot's wrist without the need for adapter plates. Choose from 3 common ISO patterns to mount to a variety of robots. Low-profile series (more info) for limited space applications that do not require air and electric pass-through. 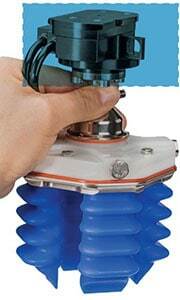 Utility series (more info) for applications that require electric and air (vacuum) pass-through to the end-of-arm-tool. Mount your End-of-Arm-Tools directly to Millibar's pre-engineered tool sides which eliminate the need for conversion plates to save space and deploy faster. Blank tool sides are available that can be modified or have Millibar customize a tool side for your tooling. One robot with many tools. One tool with many robots.